Little tutorial on how to use an external effects processor, reamp using a real amp and use SMPTE code to midi sync, all by using the “hidden output” of the R8 (and R24). The outputs of the Zoom R series multitrack recorders are very limited. Basically you got your stereo out and your phones out and that’s it. Wouldn’t it be nice to have individual outputs for each track or a sub-out to carry a mix that is separate from the master out etc. No unfortunately we’ve got just the above mentioned 2 outputs and they seem to carry exactly the same signal. 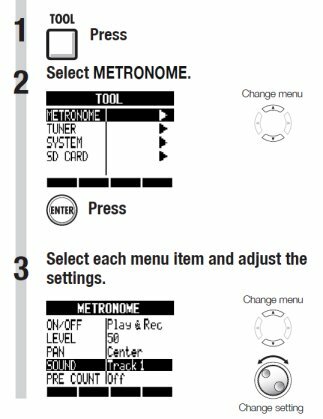 However, just looking at the input section of the panel layout you may notice there’s a “metronome” switch that lets you choose between “output + phones” and “phones only”. The metronome can be “routed” to the phones output only and it looks like you can have a different output signal on the stereo out and the phones out, it may be just the metronome but still. If you look a little further to the input section of the panel layout you’ll also find that if you set the switch to phones only the balance knob can be used to set the balance between master and click. This means that when the balance knob is turned all the way to the right (click) the only thing which is heard through the phones out is the metronome. The result is that we got 2 completely different signals, on the stereo output we’ve got the master signal and on the phones output we’ve got the metronome. This option may come in handy when you want to have your drummer hear the click at a live gig and have the master (without click) send to a PA system but other than that it doesn’t appear to be very useful but stay tuned; there are some side effects with some interesting possibilities. In the old days a click track was really a track that took one of the tracks on a multi-track tape with the recorded sound of a metronome. Zoom must have had this in mind when they implemented the options for the metronome sound. Apart from choosing sounds like “Bell”, “Stick” etc. there is also an option to choose a track as the metronome sound. More info R8 manual page 20 or R24 manual page 36. You may think the first beat/second is used as metronome sound but that’s not the case if you choose a track as metronome sound, it is just played like any other track. This gives you the ability to import a click track from a DAW being just a wav file with a recorded metronome sound. Of course if you choose “phones only” for the metronome, the track set as metronome sound source is no longer routed to the master output. This may be confusing because although a track is set to playback (green led) and the fader is all the way up, you still won’t hear it over the stereo (master) output. We got 2 completely different signals routed to the stereo out and the phones out. One being the master signal to the stereo out and one being the metronome to the phones out. If we choose a track as metronome sound this track is then routed to the phones out only and all other tracks are mixed and send to the master stereo out. For those of you using a R16, the option of choosing a track as metronome sound is R8 and R24 only, it is not possible with the R16. What we learned so far is that the unit can output a click track imported from a computer instead of the metronome sound to the phones output only and this imported click track is just an ordinary audio wav file assigned to a track. And here starts a little magic when we use this feature in an unconventional way; if it’s just an ordinary wave file assigned to a track than any track can be routed this way. If we have vocals recorded on track 1 we could route the vocals to the phones out only completely separated from the rest. Having an isolated output suddenly opens up all sorts of possibilities! How about sending this to an external effects processor like a reverb or reamping a dry recorded guitar track using any guitar multi-effect modeler you like. And last but not least you could record a SMPTE signal to a track and route it to a SMPTE to MTC converter and have all your MIDI gear in sync. Let your imagination run free and you will think of more. The nice thing about the R8 is that you can mix the 2 inputs to the final mix which means that when you use an external processor you can use its output real time during the mix, the R24 won’t allow this and you might need to record it first. Next I will give you some examples how to set it up. With the above method it’s simple to run an isolated track through an external effects processor. Just keep a few things in mind such as that the isolated track routed to the phones out is not part of your mix so it’s important to use the mix knob of the effects processor (almost every effects processor has one). You can adjust the phones output level so it matches the input level of the effects processor to avoid clipping with the PHONES control on the rear panel. Simply connect the output of the effects processor to the inputs of the R8 and mix it with the other tracks, the inputs of the R8 as opposed to the R24 can be active without arming tracks. The inputs can also be panned all the way left and right separately from the tracks which gives you the maximum advantage of your effects processors stereo output. It’s not clearly written in the manual but you can do so by pressing the pan/eq button and then selecting the inputs with the left cursor key or by pressing the input on/off switches. 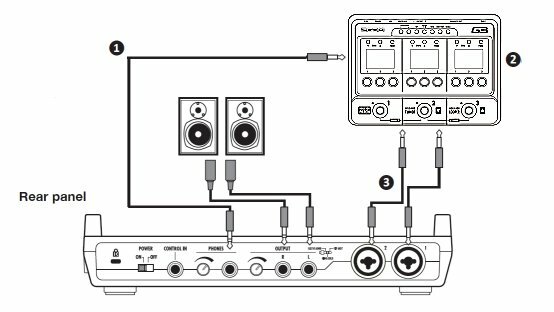 Because of these flexible inputs you can use this setup “live” during your final mix no need to record the output of the effects processor and you can adjust your effect processor setting while you go. Finally remember to always keep the balance knob of the R8 all the way to the right (click) to avoid an endless loop of feedback as you don’t want the output of the effects processor being send again to its input. 2. External effects processor with balance between original sound and effect sound adjusted with the MIX control. 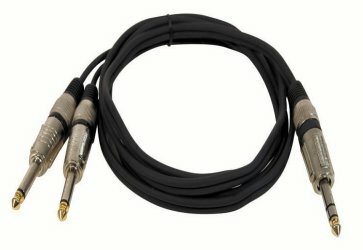 Reamping is a technique in which for example a guitarist records a dry, un-processed, un-effected track and at a later time, the recording is fed to a dedicated guitar amplifier and/or effects box(es) to “re-record” the guitarist’s unprocessed performance. It has the advantage that settings and tones can be adjusted later while the guitarist does not have to play his part over and over again and you can experiment to get the best tone suiting the final mix. Now you may not realize this but the R8 can do this all along on its own. It’s because the insert effect guitar algorithms (equivalent to the G2Nu) can also be applied to an already recorded track (see “Using the insert effects on tracks” on page 45). Recording the result on a different track is basically reamping using the internal effects processor. However sending the isolated guitar track to the phones out will let you reamp outside the box. It gives you the ability to use anything you like for reamping even a real genuine tube amp. Of course you can do this during your final mix but you could also really re-record it, it’s all up to you. TIP: use the internal insert effects only for monitoring (page 89) while you record your unprocessed guitar signal to still have some sort of guitar tone as recording a dry guitar tone can prove to be very boring. This is a great way to dial in tones because you can completely concentrate on your tone without having to hold a guitar. And another great thing is that although you’re routing this as being a metronome track the track sequencer still works for this track. This means you could just record one riff and have it loop all day while you do your tweaking. In this age and time of DAW’s, syncing midi devices directly to a multitrack recorder isn’t that popular anymore and because the R8 can operate as an audio interface it’s more or less superfluous. Still some of us prefer not to use a computer. With the introduction of the R-series multitrack recorders Zoom decided to no longer support midi sync as opposed to the HD series. If you still want midisync without using a computer you’re left with one option and that’s using SMPTE code. In the old days an audio sync tone version of SMPTE called linear or longitudinal time code (LTC) was recorded on a track of a multitrack tape recorder. Played back it was converted back again to MTC (Midi Time Code) and used to sync all sorts of midi gear. In fact the recorded SMPTE signal is basically a more complex kind of click track as it is also a way to keep “track” of time using an audio signal. Now it may be a bit old-fashion and it might be hard to find a SMPTE to MTC converter these days but it’s still a method that works remarkably well and as long as Zoom doesn’t reinvent midisync it’s an alternative. Good SMPTE to MTC converters are the Phil Rees TS1, JLCooper PPS-2 or MOTU MIDI Express XT and you may find these reasonable cheap on eBay. Of course we want this audible string of zero’s and one’s completely separated from the rest so our isolated track output to phones only method is just the way to go and luckily we can use it otherwise we couldn’t use SMPTE/LTC at all. And there’s more, apart from selecting a single track as metronome you can also select a pair of tracks like Track 1/2, Track 3/4, Track 5/6 and Track 7/8. This gives even more options like feeding a stereo signal to an external effects processor. 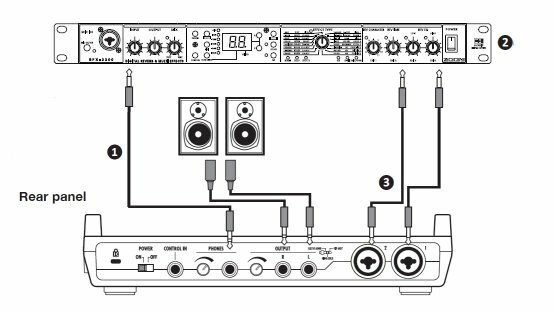 Remember the phones out is of course a stereo output (jack) and you need a stereo to mono splitter to begin with. These track pairs can be a linked stereo track but it is not necessary, it can also be 2 mono tracks. Imagine a SMTPE track to sync your drumcomputer AND a guitar track going to your guitar effect processor running at the same time. It’s clear the Zoom R8 instantly becomes much more versatile when you use this “hidden output” and maybe one day Zoom will include 2 extra outputs in their multitrack machines but for the time being this workaround will do fine. Thanks to mhelin for the idea of using the metronome sound in an unconventional way and running it in stereo. Thank you very much for the bright example of a creative approach! Hi. and thanks for the post, it’s great!! 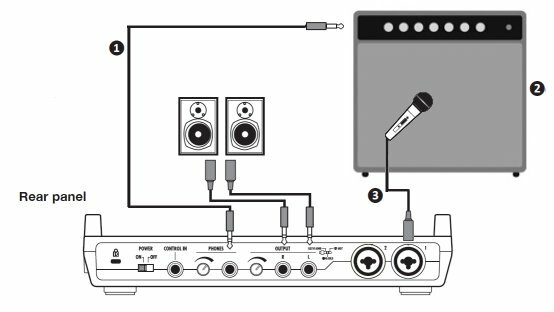 So, does the ZOOM R8 acts like a Reamp box when you connect the Phones Output into the Amp Input ?, as seen on the Reamp example 2 picture. Purists will disagree and tell you you need an extra reamp box because of the difference between high and low impedance. However for me the headphones volume control on the back of the R8 is good enough. I can lower the volume to such an extend it’s acceptable for me, but YMMV. Excelent post Henky, hope you do more on the Zoom R8. 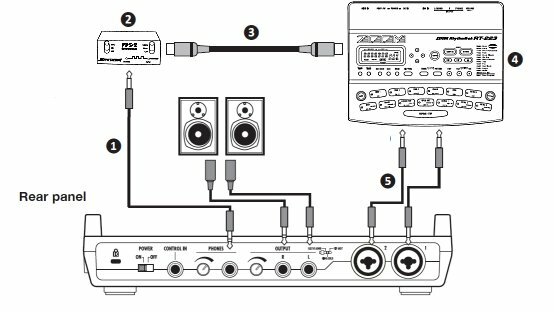 is the zoom r-8’s “stereo output” actually a stereo output? Hi, Can I use Zoom R8 as a stage mixer for a house party and record live music at the same time. A mic and a guitar will be used only. Man was I disappointed when I took my Zoom R24 out of the box and noticed there were no midi ports! I’ve been syncing to midi or SMPTE for 20 years!! I record keys to computer using midi so I can edit easily and then record guitars, etc to the machine. I was doing this with my EMU Darwin which had midi ports and before that with ADAT using track 8 for SMPTE. I finally came across this article and now I’m even more impressed with the R24!! I striped my SMPTE track, assigned it to track 24 and sent it out the headphone out to my old Opcode 64X interface to sync my computer to MTC, just like you described, works great!! I feel like it’s 1991 again, except now I’ve got 23 tracks left instead of 7 with the old ADAT!! I have some song in Cubase finished. In Coda I use Ritardando from 120 bmp to 80 bmp. In 4 Bars is tempo going slowly down. Is it possible use in Audiorecording on Zoom R24 synchronization between Cubase, in setting Master, and in Zoom R24, setting in Slave, conected thru MIDI cable? I need this complet song recorded from Cubase in Zoom R24 like a audio, but this last 4 bars must be synchronized so, that I become this correct Ritardando from tempo 120 to 80 bmp in last 4 bars, when I use Zoom R24 like Master, for replay this song without Cubase, with Correct click i Realtime for Drummers. Or I have to use a some “TRANSLATOR” device for Timecode between PC with Cubase and ZOOM R24? Sorry for my technical English, but I think You now, what I meen. Thank You for every Tips. Petr Trombik CZ. This is a really brilliant and useful addition to Zoom user knowledge base. Can you run an effects loop with the R24? Is the only condition that you’d have to record the effects to 2 tracks (stereo L/R) ? If you link 2 R24s, that gives you 16 to work with… . Would there be feedback issues/etc. ? So thank you very much for sharing your knowledge!